Imagine an emerald canvas of grassland that stretches for miles, washed in the brilliance of equatorial sunlight and brimming with an abundance of new life. THIS is the green season in the Northern Tanzania Safari – a time of plenty for the animals and a time of splendor for all those who are able to witness it firsthand. Each year, the green season is marked by extremes. Extreme colors saturate the landscape; verdant savannas are peppered with trillions of brightly-hued wildflowers that beam underneath a burning sapphire sky. Afternoon rainstorms steep in leaden horizons, eventually collapsing to the ground in a short but dramatic burst of life-giving moisture. Rainbows gleam above purple cloudscapes after the sky is washed clean, and the animals bask in the cool green splendor of this life-giving season. Extreme life dominates the Serengeti plains during this time, as the wildebeest herds take pause in their never-ending migration to give birth on the southern Serengeti plains. Thousands of tiny wildebeest calves have now joined forces with the herd; wide-eyed and gangly, these babies are building their strength on the nutrient rich Serengeti plains before the herds all are forced to move on sometime in May. These young calves have much to learn during the months ahead as the migration resumes its northward course, laden with perils at every turn. Other animals also start their families during this time of plenty, as evidenced by the numerous cubs, pups, fawns, and foals that frolic over green carpets, bringing hope for continued survival of their species to this harsh African wilderness. Extreme action and thrilling adventures are also inherent to this fast-paced season. The end of the green season including March offers arguably some of the finest wildlife viewing to be found anywhere in Africa. Amidst this world of tremendous color and teeming new life, our clients have certainly had some extreme safari experiences! Guest highlights include several fast paced cheetah chases near Ndutu, a spotted hyena clan ‘battle’ with the Naabi Hill lion pride, large elephant herds at Moru Kopjes and continuing sightings of the critically endangered wild dog (this time in the beautiful valley of Angata Kiti in the remote reaches of East Serengeti and Ngorongoro Conservation Area). 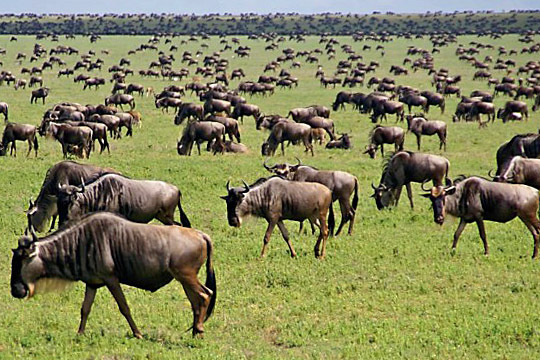 On the migration front, several medium sized herds of wildebeest remain on the Southern Serengeti Plains southeast of Kusini and also between Lake Ndutu and Naabi Hill, an area referred to as ‘The Triangle’. However, the largest concentrations of all four migratory species (wildebeest, zebra, gazelle and eland) that encompass the famed migration are currently located on Eastern Serengeti Plains. The area between Gol Kopjes and Barafu Gorge is thick black with massive wildebeest herds at the moment. Most pictures simply fail to communicate the immensity of these herds. One can stand (assuming no lions) on the top of the largest kopje in the Barafu complex and look upon tens of thousands wildebeest and zebra grazing peacefully from horizon to horizon. Outstanding! A special thanks to Ralph and Jane Anthony who sent in this spectacular wildebeest migration shot, which was taken on March 20, 2010 near the Gol Kopjes on the Eastern Serengeti Plains. It’s a challenge to capture the enormity of the wildebeest migration on the vast Serengeti Plains in a single frame and all of use here at African Dream Safaris think you did it justice with this beautiful photo! Business or pleasure? That’s the first question people generally ask about an upcoming trip. Your answer gives them a reasonable range of responses, for they understand the parameters associated with both business trips and pleasurable vacations. On the other hand, an answer of adoption travel carries no definite impressions, for it intricately combines business and pleasure along with international bureaucracy and domestic devotion. Adoption travel – traveling internationally to adopt a child – is a growing route for travelers. According to the U.S. Department of Heath and Human Services, the availability of newborns in the United States is diminishing, prompting more than 20,000 Americans to adopt internationally in 2002. Of those adoptions, more than 75 percent of the children came from China, Russia, Guatemala, South Korea and the Ukraine – five countries that represent a broad range of conditions, for both travel and adoption. Traveling to a foreign land while worrying about the adoption procedures provides a double-whammy of stress on potential parents. To alleviate the anxiety from the travel side of the equation, turn to a member of the American Society of Travel Agents. Some of the most travel-wise people in the world, ASTA members know how to prepare practically and mentally for such a life-altering journey. Adoption travel is an umbrella term for three separate journeys: the pre-adoption trip, where parents travel to another country to learn about the culture of the child they are to receive; the actual adoption trip, where parents meet and take home a child they’ve grown to love through pictures; and heritage trips, where the family re-visits the child’s homeland, allowing the child to understand his or her cultural roots. Pre-Adoption Trip: To give an adopted child a sense of their cultural identity as they grow up, it’s essential for parents to form a relationship with their child’s birth country. Reading travel books is a good start, but experiencing the country firsthand through a pre-adoption visit creates a superior connection. Understanding a foreign culture imparts invaluable insight to parents as they raise their child, for a day will come when a child asks about his or her homeland. To completely appreciate a country’s uniqueness, pre-adoption trips should be taken when a parent can focus on the culture and the people without being preoccupied with the actual adoption. Adoption Trip: Some parents who adopt internationally are provided the choice of having their child escorted to the United States or traveling to the country to bring the child home. Travel agents agree: traveling to the country is best, especially if the parent was unable to previously explore the country through a pre-adoption tour. When making plans for the adoption trip, parents often get swamped in all the details of coordinating an international visit while simultaneously filling out countless adoption papers. This is where a travel agent can truly help out. Some countries require parents to stay for long periods of time to complete an adoption. Some travel agents who specialize in adoption travel know of hotels or furnished apartments in safe areas that offer discounts to adoptive families. Travel agents who specialize in countries like China and Russia will know much about the country from personal experiences, and they’ll help you prepare for the cultural differences you’ll encounter while setting up your hotel and plane reservations. Once the weight of travel planning is off your shoulders, you’ll be able to focus more acutely on the adoption itself. Homeland Heritage Trips: With most cases of international adoption, there comes a time when the adopted child’s interest in his or her home country can only be satiated by a visit. Children are innately curious, and learning about the food, people and customs of their birth culture is a vital identity-building experience. Travel agents stress the importance of creating a wide-ranging itinerary for a homeland heritage visit, for a child should reach beyond general tourist attractions to understand the true essence of his or her culture. Include in your itinerary a trip to a zoo, where the indigenous animals will delight the child, or have your travel agent set up insightful tours away from the main tourist hubs. In the end, travel agents insist that parents take one thing along their journeys throughout the adoption process: a sense of wonder. Having a sense of wonder will help a parent adjust to new situations and become actively interested in the culture of their new child, all while keeping their composure in the face of adversity. Business or pleasure? Make it both by including a travel agent in your adoption travel plans to create an enjoyable travel experience that will help your new family start out on the right foot. Ethiopia has its own ancient calendar. The Ethiopian Calendar has more in common with the Coptic Egyptian Calendar. The Ethiopia and Coptic calendars have 13 months, 12 of 30 days each and an intercalary month at the end of the year of 5 or 6 days depending whether the year is a leap year or not. The Ethiopian calendar is much more similar to the Egyptian Coptic calendar having a year of 13 months, 365 days and 366 days in a leap year (every fourth year) and it is much influenced by the Ethiopian Orthodox Tewahedo Church, which follows its ancient calendar rules and beliefs. The year starts on 11 September in the Gregorian calendar or on the 12th in (Gregorian) Leap Years. The Coptic Leap Year follows the same rules as the Gregorian so that the extra month always has 6 days in a Gregorian Leap Year. Ethiopia is truly a land of contrasts and extremes; a land of remote and wild places. Some of the highest and most stunning places on the African continent are found here, such as the jaggedly carved Simien Mountains, one of UNESCO’s World Heritage Sites – and some of the lowest, such as the hot but fascinating Danakil Depression, with its sulphur fumaroles and lunar-like landscape. Ethiopia is old beyond all imaginations. As Abyssinia, its culture and traditions date back over 3,000 years. And far earlier than that lived “Lucy” or Dinkenesh, meaning ‘thou art wonderful’, as she is known to the Ethiopians, whose remains were found in a corner of this country of mystery and contrasts. Many people visit Ethiopia – or hope to do so one day – because of the remarkable manner in which ancient historical traditions have been preserved. And, indeed, the ceremonies and rituals of the Ethiopian Orthodox Church open a window on the authentic world of the Old Testament. In no other country is it possible to find yourself so dramatically transported back in time or to participate with such freedom in the sacred rituals of an archaic faith. The Boeing Company on Wednesday announced that it delivered its 900th 777 airplane to Ethiopian Airlines, the first of five that the air carrier ordered in 2009. 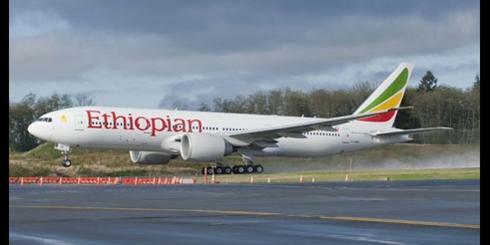 Ethiopian Airlines is investing in additional aircraft to broaden its network. The Addis Ababa-based company will use the Boeing 777-200LR for its new nonstop service from Washington D.C. and for its new long-haul nonstop routes like Beijing, China. “The 777-200LR is the only airplane that provides the range and efficiency that Ethiopian needs to service its long-haul routes,” said Larry Loftis, vice president and general manager, 777 program. The 777 program reached the 900-airplane milestone faster than any other twin-aisle airplane in history. The airplane’s performance and comfortable interior have made it the world’s most popular twin-engine long-haul commercial jetliner. The 777 program has had 1,165 orders from 61 customers worldwide. The Boeing 777-200LR is capable of carrying passengers and cargo farther than any other jetliner. It is also capable of connecting any two cities in the globe nonstop. The 777-200LR can also carry a full cargo load on routes where other airplanes are payload limited. Provisions for up to three optional fuel tanks have been added in the aft cargo area of the 777-200LR to be able to fly a range of 9,395 nautical miles (17,395 kilometers) with full passenger payload (301 passengers). Swimming with the dolphins is available at Dolphin Cove in Ocho Rios, next to Dunn’s River Falls. While there, check out the Jungle Trail, which is populated by exotic animals and tropical birds. Where else can you tour a rainforest above the trees but in Jamaica? On the Chukka Caribbean Adventures tour, you and your new husband or bride can glide among the trees from platform to platform by utilizing a system of harnesses and pulleys. A totally unique way to experience the rainforest. Be sure to check out the limestone caves and tunnels near Discovery Bay, once used as hiding places by pirates. But, the big draw is the underground Grotto Lake, accessible by boat. Considered the most romantic spot in Jamaica, The Blue Lagoon is near Port Antonio, and, according to legend, has an aphrodisiac effect on those who swim there. Enough said. You are currently browsing the TOURIST LIFE TRAVEL & TOUR blog archives for November, 2010.